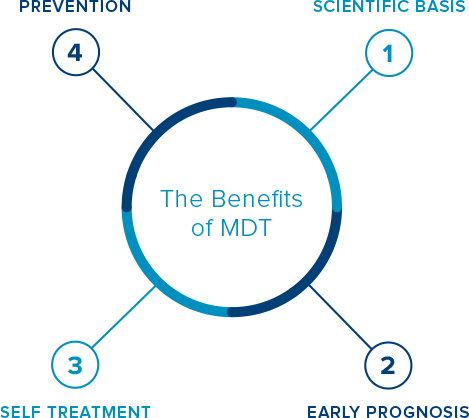 The system of patient care known as the McKenzie Method® of Mechanical Diagnosis and Therapy® (MDT) is an approach that is trusted and used by practitioners and patients all over the world for common back, neck and extremity joint problems. Most musculoskeletal pain is "mechanical" in origin, meaning that every day movements and postures cause pain. By a systematic evaluation of his patients, New Zealand physiotherapist Robin McKenzie, found that certain movements and postures can often abolish pain and restore function. Robin McKenzie believed that most patients could learn to treat themselves if taught correctly. He felt that self-treatment empowered the patient and reduced their dependency on medical intervention. The McKenzie Method® promotes the body's potential to heal itself without medication, surgery or other passive modalities such as heat, ice or ultrasound therapy. It also addresses a growing demand from patients and third party payers for professional rehabilitation services that develop the patient's self-treatment skills in a cost-effective and time-effective manner.